I’ve spent a lot of time recently talking to people about politics. I don’t mind, actually…in fact, if I can let you in on a little secret – I’m a bit of a political junkie. I love a good debate, and I enjoy crunching numbers and calculating polls. Yeah, I probably need to seek therapy. But this Measure 5 that will be voted on in a few weeks in North Dakota has me worried. It’s not that I don’t think we can beat it – I’m pretty certain we will. What I’m worried about is that people really don’t understand what’s at the heart of the issue. And the only thing worse than someone that doesn’t vote, is someone that doesn’t understand their vote. Let me try to explain: Measure 5, if passed, would take 5% of North Dakota’s share of the oil extraction tax and will set up a fund, where it will be mandated that at least 75% of the money must be allocated prior to the end of the fiscal year. It is a constitutional amendment. Let’s just stop right there. The fact that this is a constitutional amendment should be enough of a cause for pause. This measure is intended to change the course of our state. Period. Our state constitution will mandate spending. Mandate. Spending. Is anyone getting this? The amount of money is astronomical. We’re talking about millions per week. Per. Week. But enough about that…I’ve already discussed that before. This mandated spending will come off the top. Imagine, if you will, that I have baked a pie. I give my oldest son a slice. Then when my other three boys come in the house, they ask about the pie. It would be pretty hard for me to convince them that the whole pie is still there. Yet, that’s exactly what the proponents of this measure are trying to do. They claim that it’s not taking money from other projects. But, when you take a piece of the pie, that piece is gone – no matter how hard you try to convince everyone that the whole pie is still there. 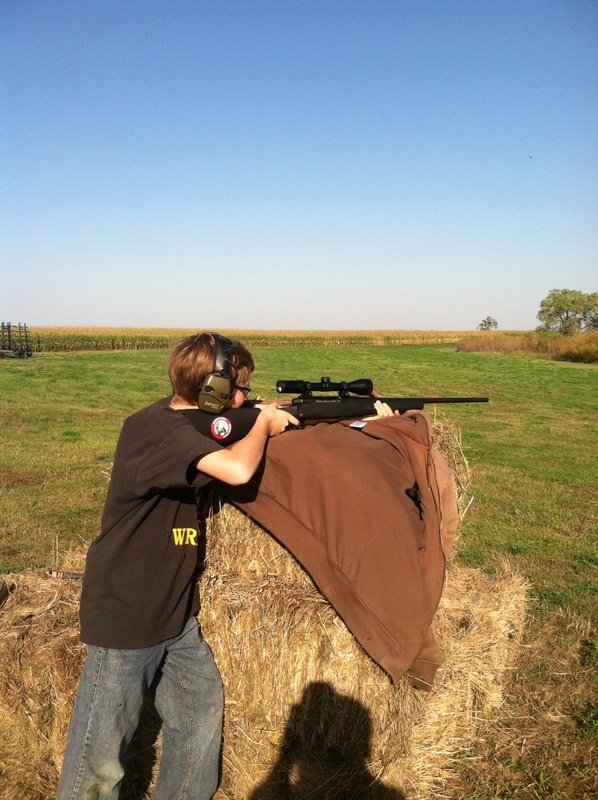 Big Bro passed his Hunter’s Safety test this summer, which means this fall was his first year deer hunting. I bought him his own .243, along with hearing protection, and he had a great few days in the field – even though the amount of crop standing didn’t help us out. Listen – I love hunting. I love our parks. I’m a member of a few. I love wildlife. And I think they’re tasty, too. In fact, I just made pheasant for supper. I have no desire to see detrimental changes to our landscape. But I will not saddle my children with a constitutional amendment that has no spending plan. I cannot vote for a measure that mandates spending in our state constitution. And I will not give my state an open checkbook to drive up land prices and wreak havoc with our property taxes. 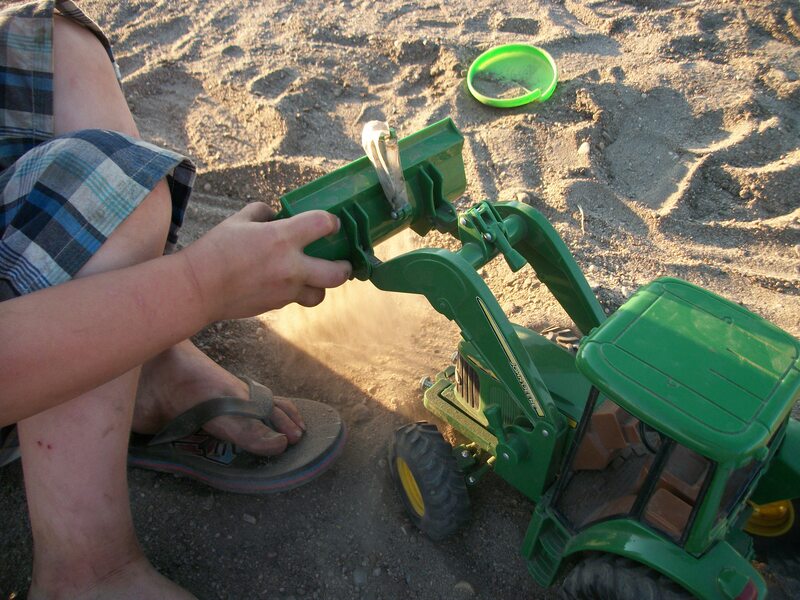 Right now, EJ plays in the dirt…but I hope that someday he’ll be able to farm in this great state. I’m doing my part to guarantee that. Will you? During the length of time allotted in this amendment, almost every acre of farmland could be purchased. I cannot vote for something that could possibly destroy what I love most about this state, and using tax dollars to do so. Don’t worry. I’m not done writing yet. This entry was posted in Agvocacy, Politics and more and tagged Clean Water Wildlife and parks, constitutional amendment, Measure 5, North Dakota politics, Wildlife & Parks Amendment by wagfarms. Bookmark the permalink. Your “whole pie” analogy doesn’t hold water. Remember, all of the funding to support this amendment comes from only 5% of the total of Oil Extraction taxes collected, not from the state’s general fund. If we collect $2 billion of oil extraction money that would mean only $100 million would go to the clean water, wildlife, and parks fund to pay for projects for all North Dakotans instead of being “taken off the top” of the general fund. By the way, that leaves $1.9 billion out of $2 billion, per this example, for everything else. Then our governor and other elected and appointed members would have to agree on how the money is to be used, with most of the votes controlled by our governor’s choices. Since when has a republican governor in North Dakota ever tried to raise your property taxes? Oh, and one more thing: This only applies to the Oil Extraction Tax, not sales, income or the myriad of other taxes collected by our state government. Your “slice of pie” would only be around 2 or so percent, leaving pretty much the whole pie left. Nobody will starve, everybody gets a piece. It is never wise to mandate spending, when things go South, and they always do…your still mandated, no matter the situation. People say only 2 percent or only 100 million like it is nothing. That’s a lot of money coming out of our roads. I feel like they are stealing my money! my understanding is that hunting is not allowed in state parks. i would not expect hunting to be permitted on lands purchased by prop 5 funds. i don’t even hunt, but in my book, that’s a fail already! NO on prop 5! No spending plan, you mean like the Outdoor Heritage Fund, the set up for this is the same as it is for that! You have established perameters of what qualifies for grants. You then submit them to the committee for approval or rejection, and then only those approved go to the granting board which is a three person committee made up of the Gov, Attorney General and Ag Com. If this is the same as the Outdoor Heritage Fund, then why do we need two? (And, by the way, I’m not a big fan of the Heritage Fund either, but now see why it was put in place.) Why does it have to be in our state constitution? Why circumvent the legislature? It’s mandated spending without a plan. Relying on grant applications to spend that kind of money? The Heritage Fund has hardly had an opportunity to work, and the requests for that funding have been minimal at best. No, thank you…this has no place in our state constitution. Period. You can repeat the claim of no plan all you want but it does not make it true. I have pointed out the plan in place, the same one used by the Leg. That said I understand that a lie repeated becomes believed to be the truth. But I digress this measure is not only about conservation preservation, it is also about parks and clean water and flood mitigation, and control and stopping of invasive species that are coming to our state either in the form of a new weed as nasty as spurge and already zebra mussels in the red river and which it is not a matter of if but when they reach waters like Sak and Devils Lake and Jamestown Res and Ashtabula etc . Because of these needs the scare tactic that DU is the implied only one going to get funds, your side has claimed they are seeking all of the projected $150 million. So your so called land grab is not going to take place remember ND Corp farm law is still in place and has no chance of being changed in the coming Leg. So again another BS claim about land grabbing which you implied. I really want people to vote on this measure and all measures based on facts not fiction. Now another lie you have told is the request for funding for the OHF, being minimal, again either said to intentionally deceive or simply made from a point of no knowledge, either one is irresponsible. Funding requests have exceeded the dollars but because of political issues many of the requests have been turned down. But in those approved request is a prime example of what this fund would and could fund at a proper rate. Currently along the Jamestown Res a rancher is receiving funding to help pay for runoff from his feedlot entering the drinking water system of the city of Jamestown. City of Hankinson I do believe also is receiving funding for park improvements and again I will point out that the funding level even with the promise of more money from the Gov is still under the requests for funds. The biggest lie is that we need these funds for schools etc… Al Carlson in his argument for lowering oil taxes last session made the claim that is not $5 billion enough for our state and now this biennium we are looking at somewhere close to $10 billion. So if Al figured ND was able to meet all its needs with $5 billion taking $300 million out of a total of $10 billion tells me that we have enough in fact if Al is right then for the period of 2015-16 years all taxes could and should be suspended!!! Right! They would still have enough based on his own words!! Sorry this is so long but to refute false claims it is clear that people who are undecided need to know the truth not the inuendos and false claims. I will say this the measure is not perfect for me but it is not the boogie man that the farm groups and API big oil have attempted to paint it as. It serves every citizens of ND in some manner from local parks and green space areas to water quality including rural water users to sportsman and yes even farmers and ranchers. Because it will do everything the OHF is doing but better because it will have adequate funding and politics regarding who the grant application comes from will be removed.